First, we believe strongly that the livestock we raise for meat should be honored during every step of the process. Read more about our beliefs and practices in raising animals humanely. However, in the case of meat, this also extends to the butchering, processing, and cooking of our meals. We believe firmly in nose-to-tail eating and want to provide as many options to the community as possible that use the whole animal. At this time, we only offer butchered cuts and fresh sausage available from the slaughterhouse. However, we are moving forward in earnest towards providing a wide variety of charcuterie items. We hope to have this in place for next year and will be offering dry-cured and smoked meats of our own recipes, incl. 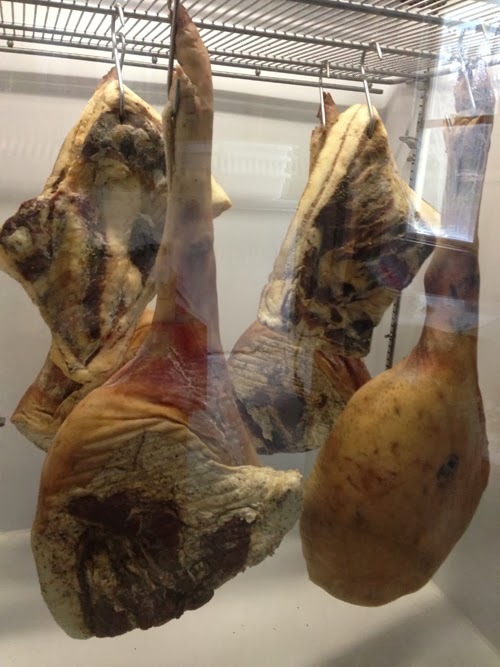 prosciutto and speck hams, dry sausages of various shapes and sizes, bacon, guanciale and pancetta, pates, and more adventurous items like head cheese. We've been making more and more of this for our own consumption and promise that it will be worth the wait. So, stay tuned! It will still be a while before we are milking our goats and even longer before we are offering dairy products for sale. We also hope at some point to provide eggs for sale on a consistent basis.